Krista Bailey, sustainability coordinator for South Bend’s Office of Sustainability, spoke to Saint Mary’s students Tuesday evening about environmentalism and innovation in the city. Her lecture, entitled, “How Students Can Create Success,” aimed to educate students and faculty about how they can join forces with various eco-initiatives in the greater South Bend community, assistant professor of political science and women’s studies Sonalini Sapra said. Bailey studied at Indiana University Bloomington and Indiana University South Bend, Sapra said. Prior to her work for the Office of Sustainability, Bailey worked as an environmental educator for more than 10 years. 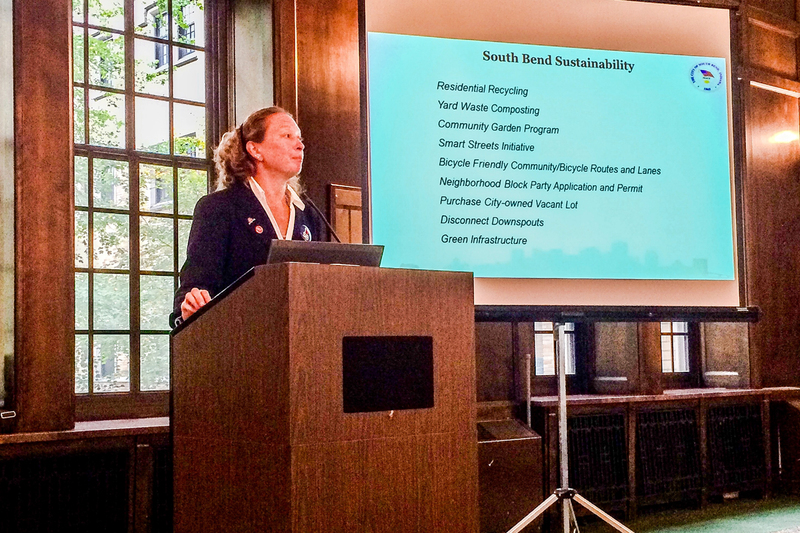 Bailey opened her discussion by addressing the topic of sustainability and the methodology of choosing to act on possible environmental, economic and social intitiatives both within city government and in the larger South Bend community. The Office of Sustainability looks to create a community in South Bend which fosters sustainability, strengthens its economy, has the capacity to bounce back from environmental stress and is inclusive to everyone, Bailey said. A sustainable program helps strengthen the community and helps the city government directly by reducing its operating expenses and improving relationships between the city and the diverse regions and residents within South Bend, Bailey said. She encouraged students and faculty to explore and discover what South Bend offers in terms of environmentalism. The Office of Sustainability is currently overseeing several initiatives, including cutting its costs by enacting sustainable approaches, she said. Another project currently in the works is the Smart Streets Initiative which will allow for more traffic to flow throughout downtown South Bend, Bailey said. Bailey said receiving input and involvement from individuals and organizations will be essential to successful programs. “We work together both internally and with members of the community to find creative and innovative approaches to preserving our natural resources, ensuring social equity and cutting costs,” she said. Collecting and using government and community-wide data will be the cornerstone of the Office of Sustainability programs, she said.